Isfrid was born around the year 1115 and later became a canon in the abbey of Cappenberg. In 1159 he became the first provost of Jerichow where he built a magnificent Romanesque church. At the urging of Prince Henry the Lion, of Bavaria and Saxony, the sons of St. Norbert in Magdeburg had turned their attention to the conversion of the pagan Wends. 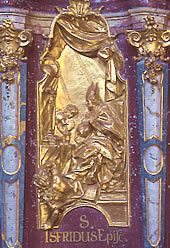 Through the intervention of Prince Henry, Isfrid was chosen as successor of St. Evermode, bishop of Ratzeburg, in 1178. He completed the erection of the cathedral begun under Evermode, and established many parishes. He also promoted the German colonization of the territory of the Wends. Toward himself he was inclined to be strict in penitential practices. Toward the rebellious Wends, however, he was a mild judge and attempted to convince and win them over through his preaching. In the year 1190 he visited the abbey of Floreffe, destroyed by a fire. According to Arnold of Lübeck, he succeeded in calling back the religious who had been dispersed in all directions for the previous year and a half; he restored the monastery and consecrated seven altars in one day. In the same year he also consecrated the Romanesque church of Postel, a daughter house of Floreffe. In the struggle between the imperial party of the Staufs and the papal party of the Welfs, he sided, in spite of all threats and remonstrances, with the defeated Duke Henry of Saxony and Bavaria, to whom he once swore fealty. He remained the confessor and spiritual director of Henry the Lion to whom he ministered at his deathbed in 1195. Isfrid defended the rights of his people against the intrigues of Emperor Frederick and his vassal, Bernard of Anhalt. Exalted through many miracles during his life and after death, he was a true light in a time of much darkness. Isfrid died on June 15, 1204 at 89 years of age and was buried in the presbyterium of the Cathedral of Ratzeburg next to St. Evermode. The fame of his sanctity spread and his cult was approved by Pope Benedict XIII on March 20/April 12, 1728. Because Ratzeburg is in the diocese of Hamburg, founded in 1995, the three holy bishops, Evermode, Isfrid and Ludolph, were transfered from the calendar of the diocese of Osnabrück to that of the archdiocese of Hamburg. Almighty eternal God, Your bishop St. Isfrid, refulgent with Your assistance, devoutly loved and strenuously defended You Church; grant, we beseech You, that obedient to the holy Gospel, we may faithfully serve Your people. We ask this through our Lord Jesus Christ, Your Son, Who lives and reigns with You in the unity of the Holy Spirit, one God forever and ever. Amen.